In 1996, the Adigudem dam had already been completed and the next assignment was to construct the irrigation canals at the downstream of the dam.Figure 1 shows Adigudem surface irrigation project (Gumselasa dam). Enterprise: Sustainable Agriculture and Environmental Rehabilitation in Tigray Region (SAERT). A semi-governmental institute and its main office was located at Mekele city, in the northern region of Ethiopia. Based upon the details provided from the land survey, the size of the farmland was 136ha. The method of irrigation designed for this farm was surface irrigation that comprised of primary/principal canal (trapezoidal), secondary canal (trapezoidal), and tertiary canals (trapezoidal). The primary and secondary canals were the main conveyors of water from the dam to the farming ground and hence the secondary canals were located at the left and right extreme boundaries of the farmland. The tertiary canals were designed to distribute water into the side furrows and consequently, it originates roughly perpendicular to the secondary canals towards the field as indicated in Figure 1. The existing waterway in the middle of the farm utilized as natural drainage of excess water to the far downstream. The canals incorporated 400 concrete drop structures (canal falls) with a size of around 1-1.7 m height and 90-1.20cms width and 0.3m thickness. The downstream and upstream side of the drop structures have actually simple stone aprons (without mortar). There were two large drop structures with stilling basins at the downstream side and concrete apron at the upstream side. Figure 2 helps to conjure up the drop structure constructed at the Adigudem site. The image presented here is not the actual picture taken at the Adigudem irrigation site but a portrayal to visualize the structures constructed at the project site (similar to these drop structures). There were three culverts; two of them were placed along the route and facilitate or used as a passage to tractors to the other side of the farm and the third culvert utilized to link up the primary canal and the right side secondary canal. The canals were dug out by local communities hardly with any assistance of machinery. There were several turnouts (diversion boxes with small gates) at the junction of secondary and tertiary canals. An illustration of the division box shown in Figure 3 and 4 utilized to demonstrate the actual turnout at the Adigudem irrigation project. There were two Large drop structures that have stilling basin with an approximate size of 3m* 2m*0.4m. 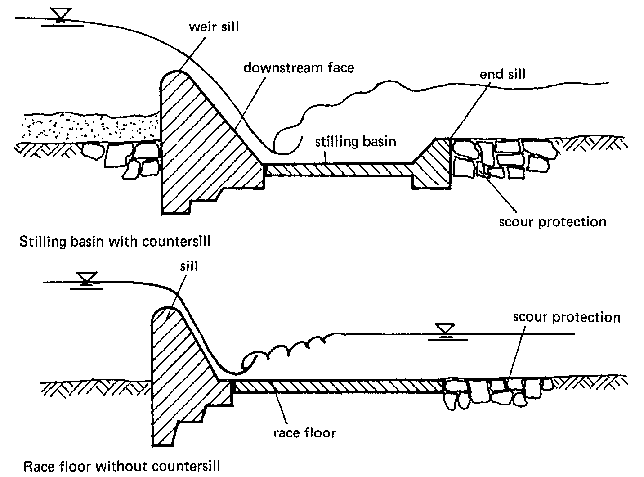 Figure 5 shows a typical example of a stilling basin. The cost of the project can certainly be roughly estimated employing the cost incurred on the 1000 laborers, two tractor operators, two paid foremen, an engineer, a co-engineer and a paid local community mobilizer. The period of construction lasts around 10 months. The cost incurred on essence and tractor maintenance, sand, cement, stone, and other design and supervision costs are not included in this estimation. Hence, the cost incurred without including the material costs is well over : 3,500,000 Birr (rate 1$ to7birr) = 500, 000$. The responsibility of the site engineer was, transmitting the layout design from the paper to the ground using surveying instruments (theodolite), identifying the placement of the drop structures along the canals and plus monitoring the construction process. The project was successfully completed and enabled the local community of Adigudem to produce their vegetables and crops throughout the year. The farm exists until now. Nevertheless, owing to the piling up of silt at the reservoir, the quantity of water that could be retained behind the dam is drastically dropped. Subsequently, this trims down the volume of water which can be used for irrigation application.